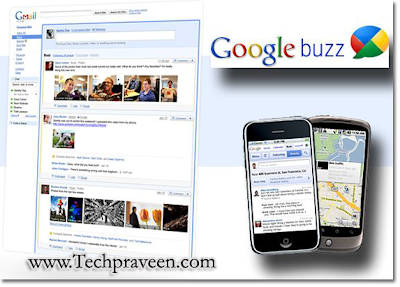 Google Buzz is accessible from Gmail.Google Buzz can have an eye on the activities of its contacts on other Google services like YouTube,Twitter or Flicker.Google buzz directly comes into your Gmail inbox. Google Buzz facilitates the organization and management of trade on social networks like Twitter from a Gmail mailbox.A new tab has just been revealed in this direction on the interface of Google Mail.Google Buzz is a viral tool designed to encourage multi-channel communications by leveraging existing contacts with a Gmail user. “It suggests some friends based on the history of e-mails and instant conversation (chat),” said the press release Internet Group. It is possible to start with Google Buzz discussion on a topic pre-determined. “The people with whom you correspond most e-mail or chat are automatically connected, so you can already follow their updates, “Google encourages. Creating the first profile Google Buzz from a Gmail account, it is required your full name and a photograph. In terms of operating in a mobile situation, the integration of Google Buzz on smartphones Android will be one of the first steps on the bottom of (geo) Localization.